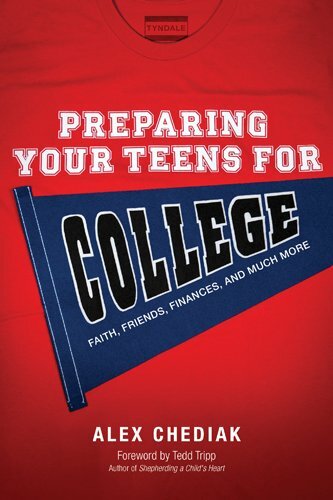 If you saw Alex Chediak’s book entitled Preparing Your Teens for College, at what point before your teen left for college would you consider purchasing it? a) A few months before your teen leaves for college? The surprising answer, at least as far as the content of this book is concerned, is that ideally you would read Chediak’s book ten years before your child goes to college or university! The reason is that Chediak’s book deals with character and maturity traps that teens fall into which greatly reduce their ability to succeed in college – and life afterwards. And you may be setting your child up to fall right into them! Here are some of the traps and how to help your child avoid them. I am grateful to J. Warner Wallace for interviewing Chediak on STR’s radio program. You can listen to the entire conversation on the podcast (it begins at hour 2 of the show). The problem: Do you wake your child up for school? Do you nag him to do his chores, finish his homework, or to get to school or work on time? If so, your child has not been taught to take responsibility for himself. If he goes away to college, or eventually has a job, he will likely not have the tools, self-discipline or self-control to manage himself properly. The solution: You need to slowly hand over responsibility to your child during his formative years – while he is still under your roof. This should begin during the pre-tween years, so that by the time your child is 12 -13, you begin to treat him like an adult. Chediak calls it ‘apprenticing for adulthood’. You begin to expect him to take responsibility for his own life and to think and act like an adult by controlling himself and his impulses. Give him an alarm clock. Allow him to experience the consequences of being late for school, or work, or of not having his homework done. He will suffer minor consequences, but you will enable him to avoid major ones later on. The problem: Has your teen ever held down a job? Has she been expected to juggle multiple demands on her time on her own? Or have you controlled her schedule so that she has ample time to fit in all her activities and get still great grades? A teen who has never had to juggle multiple responsibilities will be unprepared to do so later in life. The solution: At some point during her teen years, make sure your child has outside responsibilities (such as a job) that she must juggle with school work and other outside activities. Learning to manage a schedule and pick amongst competing priorities is an important skill set and a must for life in college and afterwards. The problem: This may sound like a strange trap, but many experts say that it is healthy for a teen to struggle with his faith. This is how he makes it his own. A teen who does not struggle or ask difficult questions of his faith is probably just borrowing that faith from you until he leaves home. The solution: Do not shy away from the difficult questions about Christianity. Don’t brush them off either. In fact, bring them up. When you listen to a news item or watch a movie, intentionally talk about issues that are difficult – like evil and suffering, other religions, science and evolution – with your child. Share your own faith struggles and invite him to do the same. The problem: Is your teen’s private life private? Something strange happens to people when they feel a sense of anonymity: they do things they wouldn’t do if they were held accountable for their actions. The solution: Monitor your teen’s internet and phone use while she is still under your roof, and tell her that you will be doing so. Explain to her that you are doing this as a means to keeping her accountable. Teach her to have a healthy distrust of her own vulnerability to temptation and anonymity. Its easy to justify our behaviour to ourselves, but not so easy to do so in front of others. The problem: Did you and your teen choose the college he’ll attend based on its strong academics, its strong campus ministries, or both? Does your teen understand the importance of having Christian friends for accountability and growth in his faith? The solution: Before you finalize your college or university selection, learn about the campus ministries and churches in the area. This needs to be intentional. Meet the campus ministry staff and attend the church before college begins. I recommend the interview with Chediak to you – there is a lot more great information in it that will help parents of children of any ages and stages. Do you have additional ideas on how parents can help their teens avoid these and other common traps? Please share them with us! Thanks for your great work in sharing proactive and important resources to help us in parenting and guiding our kids. I just shared your post with a Children’s Ministry Coordinator that we met while on holiday… Her oldest daughter is heading off to college, and we discussed the challenges likely to be faced. I mentioned how you were blogging in an effort to minister to families in this area, so I think today’s posting will be a perfect blessing to pass along to her. I’ll try to listen to the interview too. Do you know of any software I can put on my kids iPads to see what they are logging into / doing when they are on the iPad? Ideally I would like to see what is being downloaded, what programs are being used (facebook, instagram, twitter, tumblr), what time they are being used etc. This isn’t something that we’ve gotten in to yet, as our kids only use the computer under our supervision. I’m sorry that I can’t suggest anything specific, but there are many review articles on line specifically geared to parents who want to monitor their child’s internet activity. That would be a great place to start. I will research as surely there is something like this out there already. Thank you. Awesome and very educative post.This book will really apply to my 14 year old who is just going into high school.Sometimes I have wondered how to have her prepared for college and I hope this helps.